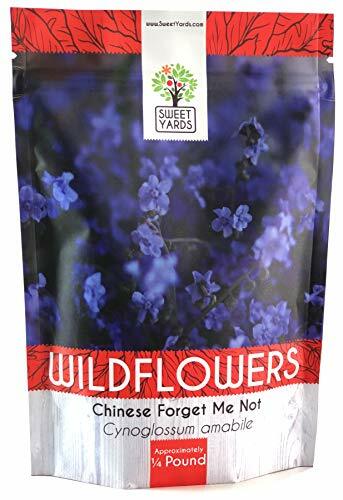 Chinese Forget Me Not - That Beautiful Blue Bloom You'll Remember All Year! These little blue flowers are well known for their carpets of blue blooms and their ease of growing. They do well in full sun or that partially shaded area of your garden. Wherever you plant them, they attract your local hummingbirds and butterflies while also making for great cut flowers to bring indoors. Who says quality and quantity don't mix!? We want to give you the biggest bloom for your gardening buck, that's why we're now offering bulk sizes of all our favorite seeds. This quarter pound bag has over 22,000 seeds in it, that's enough to plant more than 400 square feet! That's also why we only sell the freshest seeds available. Each packet is filled with our continuously rotating stock of seed, ensuring that the packet you purchase holds fresh seeds ready to plant for the current growing season. BULK ¼ POUND BAG contains over 22,000 fresh seeds! - Enough to cover over 400 square feet. BULK QUANTITY is great for filling your own seed packets, making seed bombs, or sharing with your friends! TRUE BLUE FLOWERS Cynoglossum amabile will really add a beautiful burst of color to your garden! If you have any questions about this product by Sweet Yards, contact us by completing and submitting the form below. If you are looking for a specif part number, please include it with your message. 25 Individual Sunflower Seed Favor Packets (F04) "Caution, Seeds Contain Love"Great For Weddings!